Like many of the music students at NIU Karl Haack’s first experience at here was through a summer marching band camp. He liked what he saw and heard, so he brought his trombone to campus to pursue his degree here. He began studying music education, but soon switched to focus on performance. He became part of the Huskie Marching Band a He enjoyed learning about and playing a diverse mix of musical styles with other musicians here at NIU. Haack won a competitive interview and audition process to serve as an instrumental technician for the brass section with the award-winning Naperville Central HS Band. There he taught students fundamentals and techniques, helping them achieve a successful marching band season. Now Haack is poised to achieve marching band success for himself. He learned about auditions for the United States Marine Corps Band from his roommate who had just earned a spot in the Marines drum and bugle corps. Haack auditioned and was offered a position on the spot to play trombone in the prestigious band. He has made an eight-year commitment to the Marines. 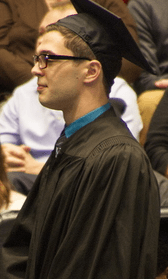 After just three and a half years here at NIU Haack graduated Dec. 13 with a bachelor’s in music.